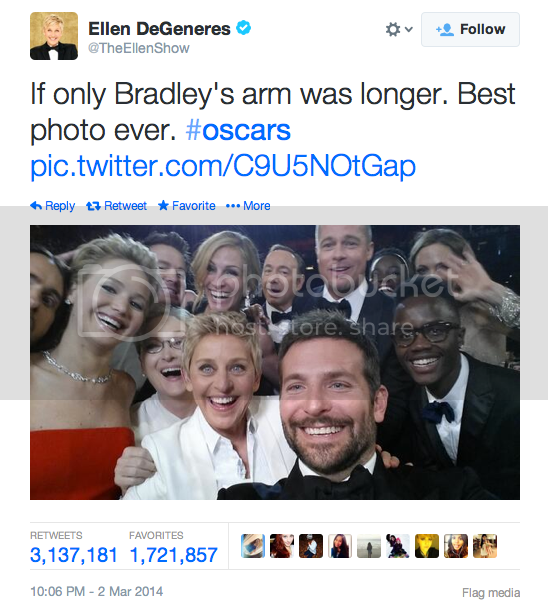 More than half of Millennials have shared a selfie (nevermind that older generations have no idea what one is) and that may be part of the reason Samsung's Oscars stunt, part of a pre-arranged ad pact between media buying agency, Starcom MediaVest, and ABC, became the most retweeted post of all-time. So what was the tab on this mobile power grab for Millennials? The Wall Street Journal reports that Samsung's total ad spend for the night was in the neighborhood of $18 million. Or put another way, $5.75 a RT and dropping.